I was born and raised in aviation-rich Antelope Valley, California, near Edwards Air Force Base in the Mojave Desert. My father was a Private Pilot and A&P so my three younger brothers and I spent many weekends flying out of Lancaster’s Fox Field, Quartz Hill and Rosamond airports which we considered ‘homes away from home’. Growing up, I was sure of two things…I knew that one day I would 1) get my pilot’s license, and 2) own an airplane. In 1979 at age 19, I completed my Private Pilot training using money I earned working nights as a substitute custodian while attending college during the day. Over the next 21 years, I graduated from college, married Victoria, got a great job with Lockheed, bought our first home and continued flying once a month. During that time, we rented aircraft and flew about 1.5 hours/month, accumulating ~350 hours total time. In 1990, I took a second, part-time, job substitute teaching elementary school kids during the day and continued with my full-time swing shift job at Lockheed. In early 1995, at age 35, we finally reached a point in our life where we could seriously consider owning an aircraft so I started looking to buy a Cessna 172. I chose the Cessna since that’s what I’d flown the most. A pilot-friend asked, “Why are you buying a C-172?” He continued to ask me questions I had no have good answers for, and finally he said, “You need to define your mission: What do you want your plane to do for you? That I could answer. Victoria and I wanted to travel, visit friends and see the USA from the air. He suggested I consider building an RV. “What’s an RV?” I asked… I began researching the Van’s series of aircraft. After ordering the Van’s information kit and watching the video, I believed that I (too) could build an RV just as many other people (from all walks of life) had done already. I could see her point, especially since I had no previous building experience whatsoever; not even RC aircraft. I learned to work on cars from my Dad, so at best, I was a weekend auto mechanic. I made sure that I worked on the plane every day and often worked ten hours on Saturday and Sunday. Victoria helped me whenever needed, and when she couldn’t, many friends pitched in. 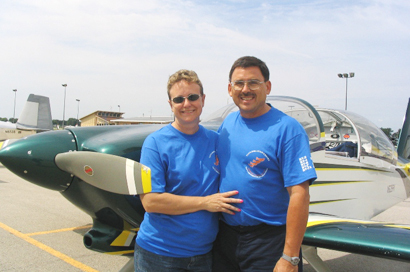 After nearly 5 years and 3000 hours of building, our friend Norm Howell made the first flight on Father’s Day, June 2000. Since then, we fly our plane every chance we get and have logged over 4000 hours in it. We’ve landed in forty-nine of the United States, Canada, Mexico and numerous islands in the Caribbean Sea including Bonaire, Cayman Islands, Grenada, Martinique, Puerto Rico and Virgin Islands. We’ve flown so much we wore out our first engine and replaced it with a new one. I promise you that building and flying your own RV aircraft will change your life, and you will not be disappointed! Feel free to contact me at n628pv@sbcglobal.net if you’d like to know more about our adventures. I wish you the very best in your decision to build an RV aircraft!